One of the more interesting Downtown debuts of last year was b.o.s. (pronounced "boss"), which bowed at the end of October. 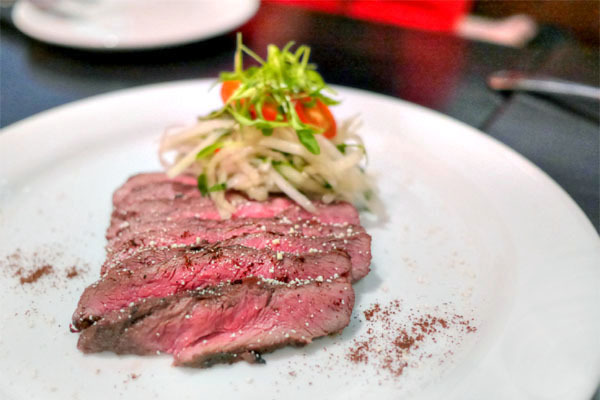 The place is named after the Latin word bos, which translates to cow or ox, and is the work of Chef David Bartnes and Jun Isogai, the former GM at the nearby Men Oh Tokushima ramen who was inspired by the beef-centric eateries he found in Japan. 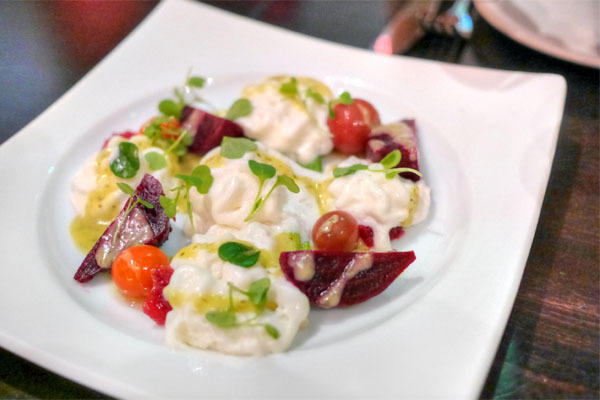 As the name implies, the restaurant focuses squarely on bovine-derived proteins, serving up "nose to tail" dishes in roughly pan-Asian fashion. About the Chef: Bartnes was born in Oregon, but left the US at age three, growing up in both Asia and Europe thanks to his Chinese/Japanese/Korean mother and German stepfather. He fell into cooking in the late 1990's whilst living in the UK, and subsequently enrolled at the Le Cordon Bleu, graduating in 1999. Bartnes then spent a year as a tournant at the Hilton in Shanghai, working his way around the various departments at the property. In 2000, he moved to Phuket, Thailand to cook at the highly-regarded Blue Canyon Country Club, then transitioned to Siam Supper Club, where he became Executive Chef and partner. His next step came in 2004, when he returned to Shanghai and cooked at a variety of restaurants and worked stints in catering and consulting. 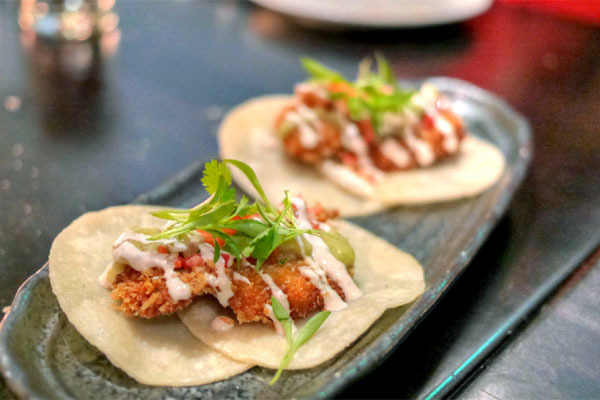 Bartnes relocated to Los Angeles in 2007, finding employment at a Hollywood nightclub before taking on the Chef de Cuisine role at Sai Sai at The Millennium Biltmore in 2008. His latest position was that of Exec Chef at the Downtown Marriott. 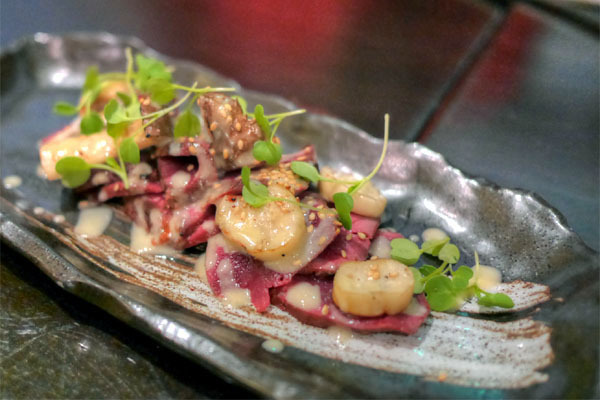 The restaurant occupies the Honda Plaza space that once held Raku and Izakaya Yuji, next to the perpetually-packed Sushi Gen and a couple doors down from shabu specialist Kagaya. The room's been spruced up since its days as Yuji, and is now a lighter, quieter, more restrained sort of place. b.o.s. 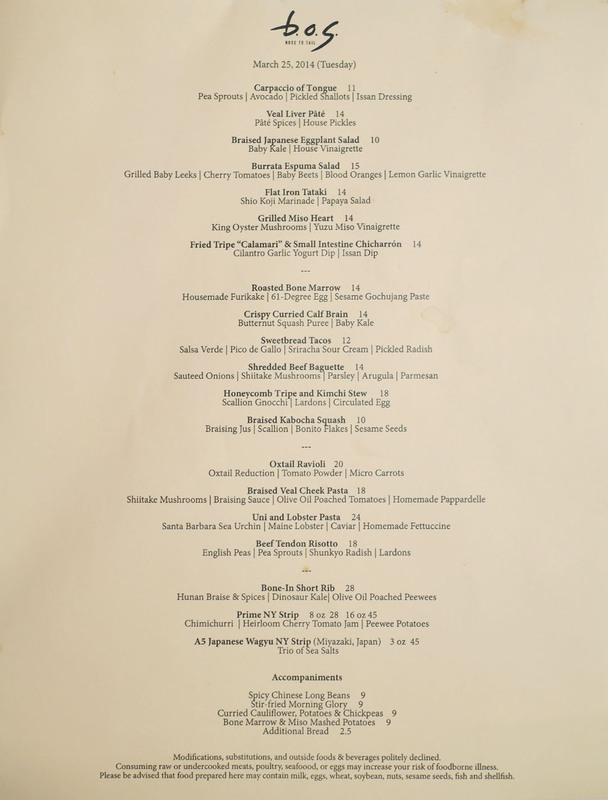 's menu is delightfully beef centric, featuring a bevy of mostly bovine selections of increasing intensity. 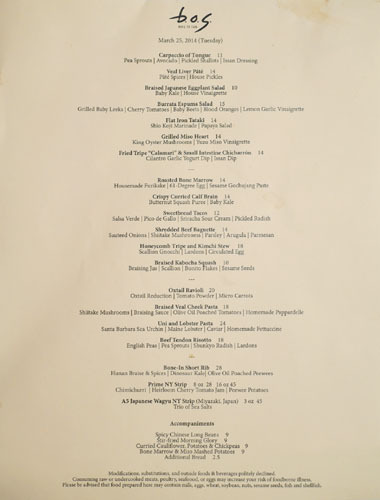 In the past, there was also the option of an $85 omakase-style tasting at the six-seater Chef's Counter, but such a menu is only available by special arrangement now. 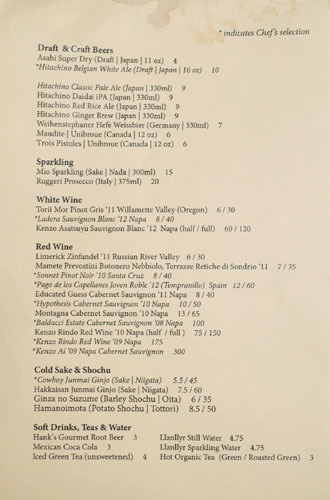 Meanwhile, to imbibe, think a small selection of wines, beers, and sakes, specifically chosen to pair with the substantial amount of meat on the menu. Corkage is $20, though it was waived for our beers. Click for larger versions. 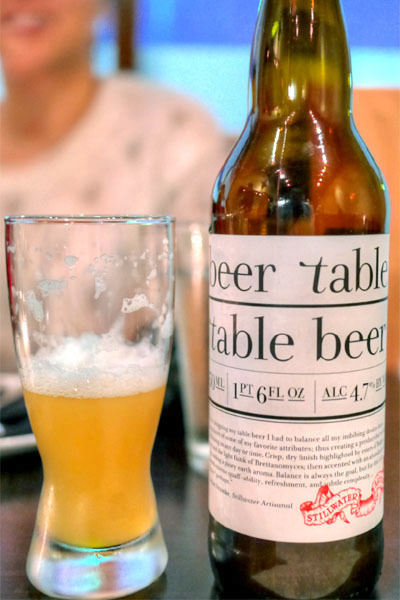 I ended up bringing a number of bottles to try, the first of which was the Stillwater Artisanal Beer Table - Table Beer. It was easily the lightest of the bunch, and a nice start to things with its fruity, funky, yeasty character up front and surprisingly hoppy finish. 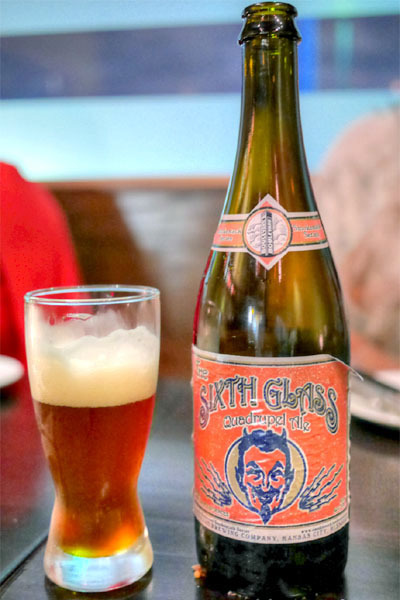 Balanced and easy-drinking. 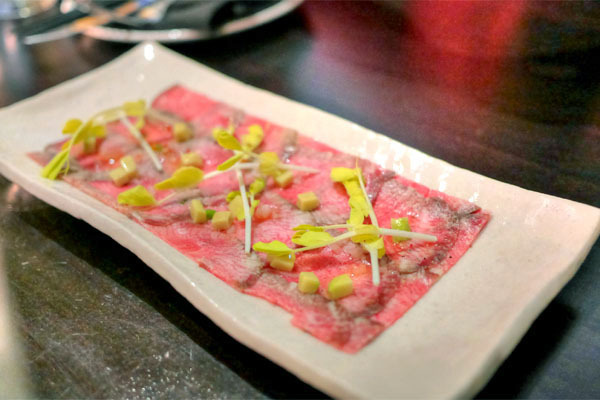 Thinly-sliced tongue was up first, a promising beginning to the meal. The meat showed off a restrained, elegant, surprisingly mild sort of meatiness that was beautifully set off by the tangy Isan-inspired dressing, all while the greens imparted a great bitterness and crunch to the mix. Beets were smartly presented here, their earthy sort of sugariness tempered by the lush, creamy dollops of burrata while the various accompaniments lent contrasting notes of sweet, sour, savory, and bitter that came together nicely. 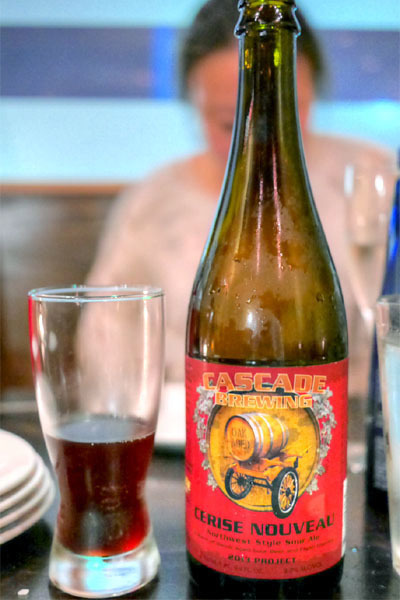 Next up: the 2013 Cascade Cerise Nouveau, which I'd picked up recently during my visit to Portland (it's only available for sale on-site apparently). The beer was an oak-aged red ale infused with Bing cherries, and was pretty delicious, with a subtle, yet still puckering tartness enhanced by an undercurrent of cherry sweetness that was always apparent, yet not domineering. Flat iron steak arrived seared and imbued with a great depth of flavor thanks to its treatment with shio koji (a blend of fungus-infected rice and salt). Meanwhile, the papaya salad was spot on as a moderating element in course, really evening things out with its wonderfully crunchy, acidic character. The binchotan-grilled heart was a standout, with the offal arriving slick and supple to the bite, its beefy relish augmented by the smoky taste of eringi. I also loved the texture of those mushrooms, as well as how the bright, tangy vinaigrette tied it all together. This is one you have to get, and very possibly the best preparation of heart I've had. Here we had a duet of fried entrails. Tripe was tasty, soft and supple on the inside, but with a crispy coating of batter. It had an almost curry-esque quality to it, and really worked with the bright, refreshing sauce on the side. The intestine, though, was even better, with a great crunch and savoriness to it that went swimmingly with its tangy condiment. 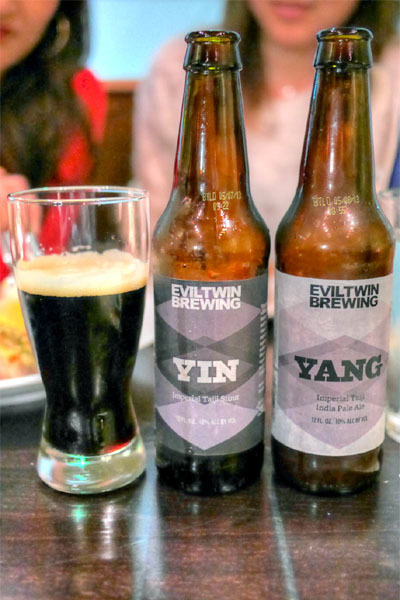 2013 Evil Twin Yin & Yang were blended together to make the tastiest Black and Tan I'd ever had. Think sweet and roasty initially from the stout, but with a growing hop bitterness from the IPA that really balanced the drink out. Delish. 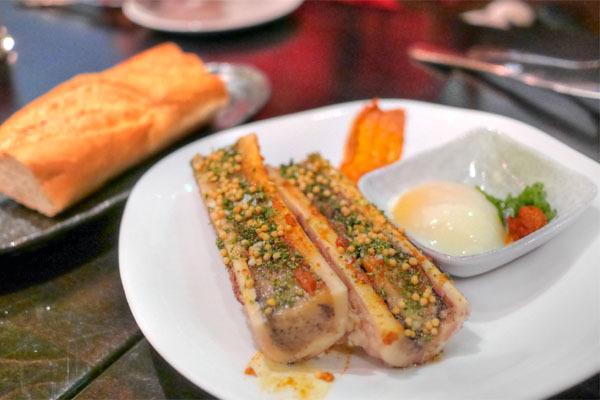 Bone marrow was another table favorite, and one of the strongest preparations of the ingredient I've tasted. The actual marrow was as slick and slippery as you'd expect, its lush flavors imbued with a distinct Asian-y slant while the furikake gave things a great crunch. The crux here, though, was that combination of egg and gochujang, which provided a combination of spice and lushness that perfectly rounded out the dish. Eminently balanced overall, and at the end, we really wanted some more bread to sop up the remaining sauce. Brain was surprisingly delectable, and pretty much the most innocuous preparation of the organ that you're ever gonna have. Panko-coated and fried crisp, it was sort of like an earthier, creamier version of sweetbreads that I rather enjoyed, especially when taken with the bitter shreds of kale on the plate. Even the squash worked, coming out not nearly as saccharine as I'd feared. The next beer was the Boulevard The Sixth Glass, a quadrupel-style ale that I liked as well. It was fruity, sweet, and malty at first, its dark fruit essence always apparent, yet utterly well integrated, with a slight bitterness toward the finish. 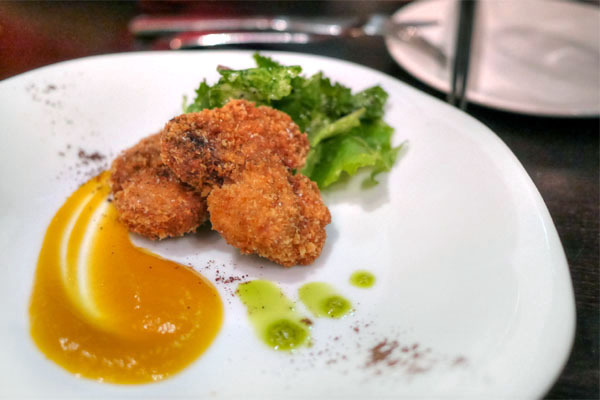 Sweetbreads were another winner, some of the best I've had in fact. Texturally they were spot on, and I loved how the organ meat's slightly funky flavors were evened out by the myriad of tart, tangy, creamy flavors at play. Great tortillas, too. Here was what our server described as a Korean-style menudo. 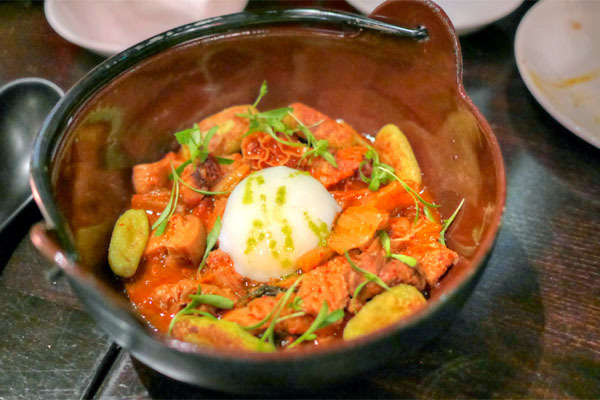 Tripe was cooked to an utterly soft, slick consistency, the earthy flavors of the stomach enhanced by the fire of kimchi and those salty lardons, the gnocchi grounding the dish at the same time. 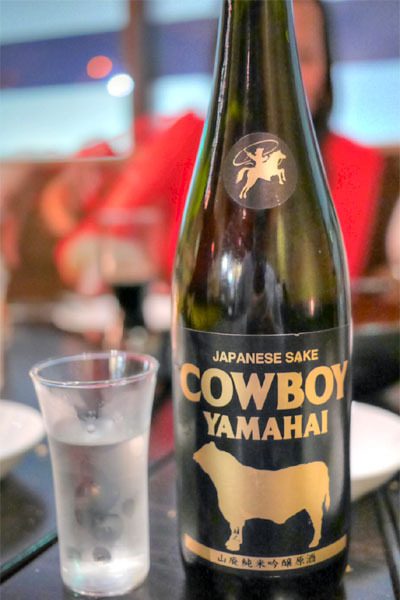 At this point, we were given a taste of the Cowboy Junmai Ginjo, Niigata, which is ostensibly brewed specifically to go with beef. It was perhaps a bit more assertive than your typical sake, with a semi-viscous, smooth body and rice-y sweetness that fared better than most when taken with all this meat. 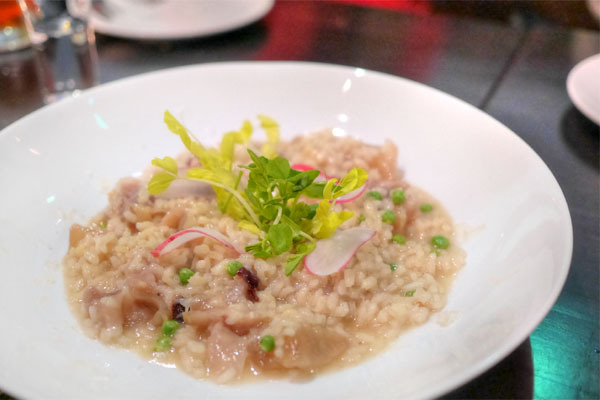 I just had to get the risotto, natch, and the use of tendon here made it quite unlike any other I've had, adding an intriguing textural variety to the dish that worked alongside the rice. Taste-wise, the tendon didn't add too much, but rather, it was all about the combination of salty lardon and wonderfully bright veggies here. 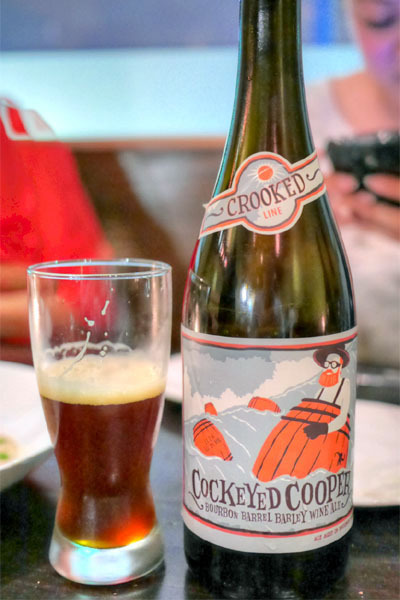 Our final beer was a bourbon barrel-aged barleywine, the 2012 Uinta Cockeyed Cooper. I was a fan of this as well, finding is malty, fruity, almost chocolate-y base a fitting pair to the woody, somewhat vanilla-tinged flavors in the brew. 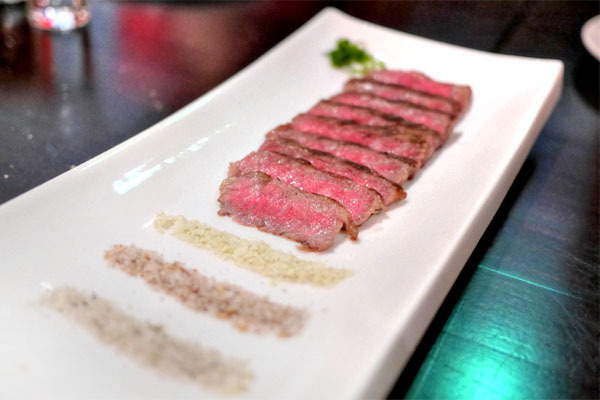 The kitchen then sent out the A5 wagyu, which came fatty and marbled, with a sophisticated beefiness to it was amplified by a dusting of the three salts: lime, chipotle, and wasabi. b.o.s. 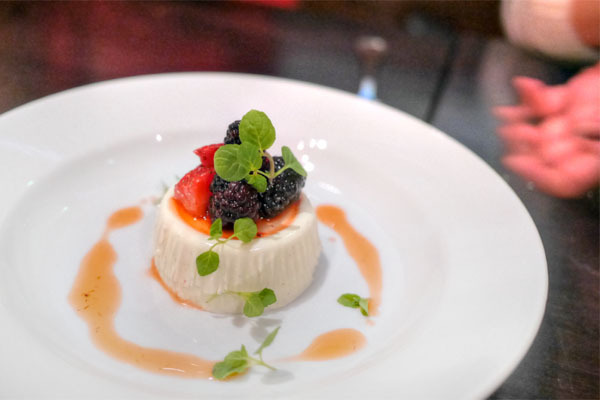 features a single dessert, and tonight's was a panna cotta, one with smooth, creamy vanilla flavors that made sense against the sweet-n-sour notes of the accompanying berries, all while the dish was brightened up by tiny pricks of herbaceousness. With the possible exception of Totoraku, this is the only restaurant in LA so unabashedly focused on all things cow. I have to say, though, that I came out of the dinner suitably impressed by this seemingly harebrained concept from this virtually unknown chef. 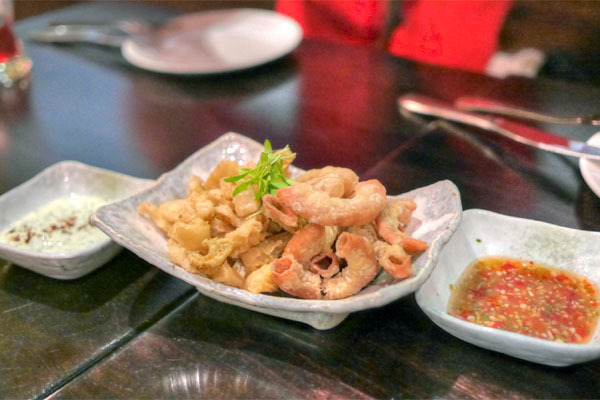 The cooking is a smart combination of international, mostly Asian-y influences over a classical base, and plates rightfully focus on flavor first, not shock value. 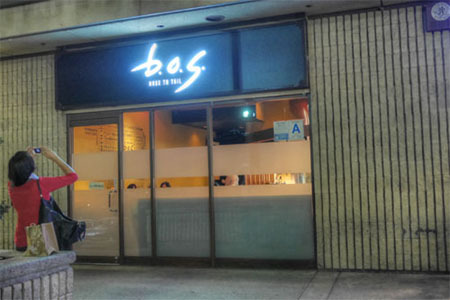 There were some seriously delicious dishes going on tonight, and in my mind, b.o.s. is no doubt one of the best openings to grace Little Tokyo in a long time. You aren't kidding about the ALL things cow! This looks utterly amazing. I must try ! Andy: I know, right? 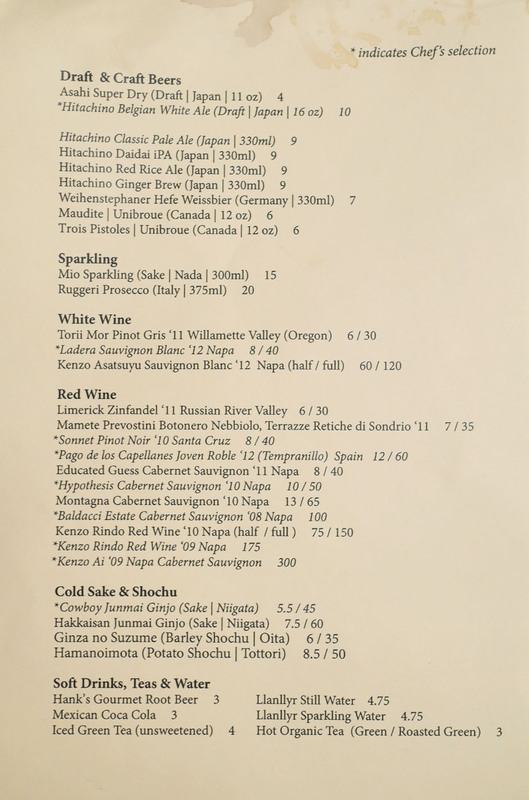 And they're fairly liberal about corkage it seems, so it might be a place where you can do your wine thing. Peter: Are you confusing me for Darin Dines? we previously negotiated corkage on our end when we went. I think $50 for the table. Charlie: Thanks for the tip. I saw a photo of that oxtail, and it looked pretty legit. What else is on the off-menu menu? Peter: Indeed we look alike, but I hold a higher standard for us being able to tell each other apart lol.